Charlotte Eskildsen is the founder and creative director of Designers Remix and Little Remix. Designers Remix is a Danish fashion brand based in Copenhagen. The collections cover women’s ready-to-wear, shoes and accessories. Little Remix is a kids’ fashion brand with a direct line to Designers Remix for girls age 4-16. Charlotte Eskildsen is born in Denmark and she received her degree as a fashion designer from the Design Management School in Kolding, Denmark. 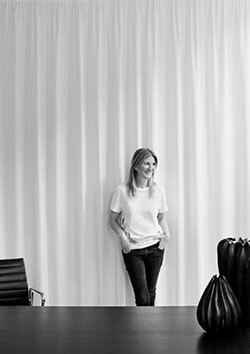 Her inspiration is deeply founded in her Danish design heritage. Danish design icons, organic modernism and functionalism are key factors in every aspect of her creative process. Charlotte’s unique design manifest is all about minimalism and architecture. Designers Remix publishes the new sustainable strategy for the brand going forward under the headline “Remix Reborn: Make Fashion Better”. It is the target to become a sustainable champion by 2020 that does not compromise with the environmental- and social responsibility nor the design DNA of the brand. Designers Remix collaborates with Swiss eyewear brand VIU. The collaboration captures the fine craftsmanship, design heritage and sustainable agenda of both brands in two sunglass styles handmade in two different colours each. Designers Remix wins the award “Show of The Year” at ELLE Style Awards 2018 for the SS18 show, held at the architechtural masterpiece Circle Bridge by Olafur Eliasson. Designers Remix has a unique sustainable design collaboration with young aspiring talents from The Royal Danish Academy of Fine ArtsSchools of Architecture, Design and Conservation in Copenhagen. The circular and up cycled subline, Designers Remix Preloved has been the main subject of the collaboration. The 12 students has been given the task of creating a unique piece using only the pre-owned clothes from Designers Remix. Designers Remix opens a stand alone pop-up shop in the heart of Oslo, Norway. The pop-up is open for 6 months, however the shop will change from time to time as the shop is made upon the idea of a transitional retail space that can transform with continuous consumer events. Designers Remix celebrates the 15 year jubilee setting the sails for a new sustainable initiative for the future of Designers Remix. The name of the project is “Preloved Remix” and is a circular project that seeks to produce garments using minimal resources. In the future the Designers Remix customers can hand in preloved Designers Remix styles from the past 15 years in the flagship stores. These garments will then be remade or remixed into new styles sold exclusively in the stores. A unique collection of previous lovers deeply founded in the Designers Remix DNA. Designers Remix launched the poster project “Untitled Project” in collaboration with Dutch born fashion photographer, Marco Van Rijt. The project was closely connected to the SS17 campaign “Angel Valley” and consisted of 10 curated images of backyards in Los Angeles shot by Marco himself. Each poster was printed in 40 copies, numbered, and sold exclusively in the Designers Remix flagship stores. Designers Remix launches a new collection of leather goods that captures the essence of Nordic minimalism and craftsmanship. The Gigi collection is carefully designed in the brand aesthetics when it comes to shape, quality, and durability. The style of the square-like bags is minimal and Scandinavian, but feminine and soft around the edges. The eye-catching stab-stitched finishing along the edges stands a symbol of the fine craftsmanship that up until today has been valuable part of the House of Designers Remix. The collection is launched in new colours every season following the RTW collections. Designers Remix opened a travelling pop-up shop in collaboration with United Arrows in Japan. The pop-up shop travelled in between 6 shops in Tokyo, Kobe and Kyoto. A selection of FallWinter15 styles is displayed at the Danish Fashion NOW exhibition at the Museum of Brandts, Denmark. Charlotte Eskildsen creates a sustainable capsule collection for the Copenhagen Fashion Summit along with a look for Her Royal Highness Crown Princess Mary, which she wore at the conference. Charlotte was appointed external examiner at the Royal Danish Academy of Fine Arts, Schools of Architecture, Design and Conservation. Charlotte Eskildsen is the official mentor for designer Anne Sofie Madsen during the Dansk Design Talent – Magasin Award. Anne Sofie Madsen is the winner of the competition. Designers Remix receives the prestigious ‘Brand of the Year’ award at the Elle Style Awards, Denmark. Charlotte Eskildsen is enlisted in the Who’s Who Encyclopedia of Denmark ‘Krak’s Blue Book’ (Kraks Blå Bog). Designers Remix receives the prestigious ‘Brand of the Year’ award at the Danish Fashion Awards (Dansk Fashion Award). Charlotte Eskildsen works as an ambassador for the Danish Red Cross as a member of Club 10, a club committed to raise money for the Red Cross Disaster Relief Fund. First collection of the kids line ‘Little Remix’ is launched. Charlotte Eskildsen receives the “The Golden Button” (Guldknappen) from the Danish fashion magazine ‘Alt for Damerne’. Charlotte Eskildsen is chosen as a “Rising Star” by the Danish business magazine, ‘Berlingske’. Designers Remix is founded by Charlotte and Niels Eskildsen. Charlotte Eskildsen is educated designer, Design Management, Kolding, Denmark.